Stowe, VT. 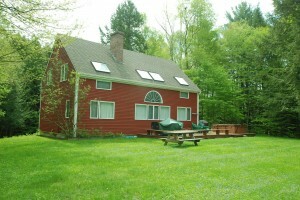 Vacation RentalFour bedroom rental very close to Stowe Mountain Resort. This large house has four bedrooms and three and half bathrooms with direct views on the mountain. Located just off the mountain road, this rental offers proximity to all Stowe has to offer with the privacy you expect in a Vermont home. The home features a spacious living room with a wood burning fireplace, flat screen TV and stereo, and views of the mountain. There is a dining room that seats eight people and an open fully equipped kitchen with breakfast bar. Additionally on this level you will find the master bedroom with a king size bed and en-suite bath. The next level features another master bedroom with king size bed and two additional bedrooms one with twin beds and another with bunk beds and a twin. The entry level of the house has a TV room with a pull out sofa, flat screen TV and full bath. Top all of this off with a wrap around deck with patio furniture, grill and hot tub. Enjoy all Stowe and Vermont have to offer and feel like you are at home.